Eagle Ridge Townhomes face the open space along the Blue River in the Warriors Mark neighborhood, and have large living room windows, a balcony and an upper floor clearstory, all of which open onto this view and allow the late afternoon sun to fill these homes. All the Eagle Ridge townhomes for sale are just over two thousand square feet and are the same layout with a small basement and two-car garage. Built in a saltbox style in the nineteen-eighties they are wood construction, situated on a large flat lot with a small yard in back and a verge in front. The Warriors Mark neighborhood is on the south side of Breckenridge, convenient access for drivers coming from the south, and is a quick drive or easy walk to the heart of downtown. Learn more about living in this one-of-a-kind Breckenridge subdivision, or browse the available Eagle Ridge townhouse listings found below. The base of Peak 9 of the Breckenridge ski area is at the northern end of the Warriors Mark neighborhood and Eagle Ridge homes for sale are just a few blocks south of it. 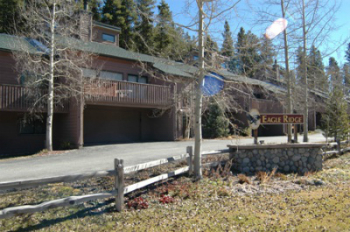 Trails lead from the neighborhood to downtown Breckenridge and the national forest, and the free town shuttle bus runs along Broken Lance Drive where these townhomes are located. The stretch of the Blue River across the road has been known to provide good fishing for neighborhood residents. Broken Lance Drive, Warriors Mark. We couldn't be more excited to help you on your homeownership journey in Breckenridge. Contact us now to get started today!